We are reaching the limits of silicon capabilities in terms of data storage density and speed of memory devices. One of the potential next-generation data storage elements is the magnetic skyrmion. A team at the Center for Correlated Electron Systems, within the Institute for Basic Science (IBS, South Korea), in collaboration with the University of Science and Technology of China, have reported the discovery of small and ferroelectrically tunable skyrmions. Published in Nature Materials, this work introduces new compelling advantages that bring skyrmion research a step closer to application. It is envisioned that storing memory on skyrmions - stable magnetic perturbations of whirling spins (magnetic moments) - would be faster to read and write, consume less energy, and generate less heat than the currently used magnetic tunnel junctions. In future memory and logic devices, 1 and 0 bits would correspond to the existence and non-existence of a magnetic skyrmion, respectively. Although numerous skyrmion systems have been discovered in laboratories, it is still very challenging to produce controllable, nanometer-sized skyrmions for our technology needs. ▲ Figure 1: Graphical representation of magnetic skyrmions. While ferromagnets have their spins (magnetic moments, represented as arrows) aligned uniformly in a parallel fashion, magnetic skyrmions are formed by spins arranged in a whirl shape. In this study, the researchers found out that skyrmions with a diameter smaller than 100 nanometers spontaneously form in ultrathin material, consisting of a layer of barium titanate (BaTiO3) and a layer of strontium ruthenate (SrRuO3). Below 160 Kelvin (-113 Celsius), SrRuO3 is ferromagnetic, meaning that its spins are aligned uniformly in a parallel fashion. When the two layers are overlaid, however, a special magnetic interaction swirls SrRuO3’s spins, generating magnetic skyrmions. Such peculiar magnetic structure was detected below 80 Kelvin (-193 Celsius) by using magnetic force microscopy and Hall measurements. In addition, by manipulating the ferroelectric polarization of the BaTiO3 layer, the team was able to change the skyrmions’ density and thermodynamic stability. The modulation is non-volatile (it persists when the power is turned off), reversible, and nanoscale. ▲ Figure 2: Controlling skyrmions’ density with electric fields. 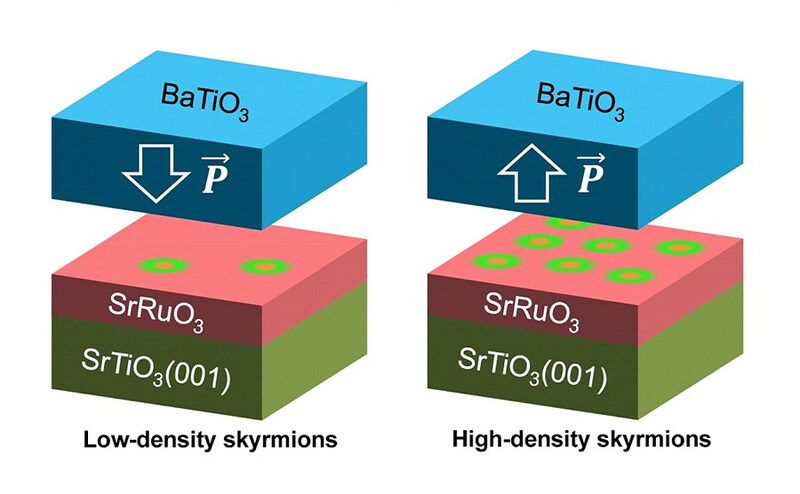 This study measured skyrmions in an ultra-thin material made of a ferromagnetic layer of strontium ruthenate (SrRuO3), overlaid with a ferroelectric layer of barium titanate (BaTiO3) and grown on a strontium titanate (SrTiO3) substrate. BaTiO3 is ferroelectric, meaning that it has a switchable and permanent electric polarization(𝑃⃗), while SrRuO3 is ferromagnetic below 160 Kelvin (-113 Celsius). At the BaTiO3/SrRuO3 interface, the BaTiO3 ferroelectric polarization swirls the spins in SrRuO3, generating skyrmions. If the researchers flip the direction of polarization in BaTiO3, the density of the skyrmions changes. "Magnetic skyrmions and ferroelectricity are two important research topics in condensed matter physics. They are usually studied separately, but we brought them together," explains Lingfei Wang, first author of the study. "This correlation provides an ideal opportunity to integrate the high tunability of well-established ferroelectric devices with the superior advantages of skyrmions into next-generation memory and logic devices."